When looking for a gym bag you need to focus on a few key things. What sort of gym gear will you be putting into the bag, wet or dry, will it be for indoor use or is it going to be thrown out on the ground in the rain, and how big does it need to be. Women’s gym bags come in many shapes and sizes so have a think about what you actually need to carry before you jump in and buy the nicest looking one. It might look super trendy but not much use if you have to carry a second bag to carry the rest of your gym gear. When you pick out a gym bag there are a few things that are a must for any good gym session. We have compiled a top ten list at the bottom of this post – be sure to check it out. Looking for a waterproof gym backpack, or something durable that you can throw in the trunk of the car. Something hard-wearing that you can drag around to the gym. A backpack that will stand up to a lot of punishment? The North Face - Misc. If it’s more of an all rounder gym bag you are looking for then you should go for a duffle bag. if you are out on a trek through the woods. nothing when not in use! Some other features you might want to look for. Does it have a wet clothes compartment for swim suits and wet towels? Is it easy to clean and keep germ free? Will you need to lock the bag or will it be stored in a secure locker room while you are off training? We have put together a high-level review of our top choices for gym bags for women. Let us know what you think and if you have a great bag that is not on our list then reach out and we may add it in. Here are ten things you should have in your gym bag for every workout. Coming in at number one is Workout Clothes. No point in going to the gym in your work clothes or trendy pin skirt. You might look cool but it won’t do you any good when you hit the treadmill, stepper or weights. A good sports bra is essential for working out. Make sure you get something that fits correctly and gives you plenty of support without cause discomfort, wicks out sweat and keeps you cool while you power on. 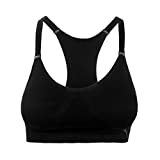 There is a great selection of women’s gym clothing on Amazon and if you look about you will find everything you need, sometimes with great discounts – up to 70% in some cases so go take a look. Stick to the better brands if you can because if you are like me in the gym then your clothes are going to get hammered so you don’t want them to fall apart – especially in the middle of a workout. Pick something light but flexible, hardwearing but comfortable and make sure it can be thrown into the washing machine with just about anything so it doesn’t sit in a pile until you wash something the same colour. Cotton socks and a good sports bra are also essential items so pick them up while you are at it. Number two on the list is shoes. Shoe selection depends on what you are doing in the gym and the list goes on for miles. One shoe we always lean towards are Asics. This awesome all rounder is perfect for every style of workout. Whether you are out running on the road or hitting it hard on the treadmill these runners will keep you on the right path. Because the list and styles of women’s gym shoes are so extensive you need to think about what your primary objective in the gym is going to be, but also what you do exercise wise outside of the gym. Are you a big runner, track or cross-country or do you just go for long walks and want a pair of runners that will suit for both the gym and outdoor use. Because the list and styles of women’s gym shoes are so extensive you need to think about what your primary objective in the gym is going to be, but also what you do exercise wise outside of the gym. Are you a big runner, track or cross-country or do you just go for long walks and want a pair of runners that will suit for both the gym and outdoor use. 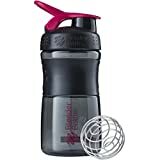 Up next is a shaker or water bottle. If you are serious in the gym you will be consuming protein of some sort while you train. Do yourself a favour and get yourself a proper shaker. It will save you chugging down lumps of unmixed protein shake. We really like this one from BlenderBottle. When you start to train properly and depending on your focus you might start taking protein or supplements. This is something that you will have to do some research on to make sure you get the right balance. You don’t want to take protein or supplements that will bulk you up if you are trying to slim down and tone. You should also make sure that you purchase all of these from a reputable supplier as sometimes you can get knock-off variations that are produced in places that do not follow any of the regulations or standards associated with producing health products. Whatever path you take make sure you read the label and that the product suits your needs. You will want to bring your own towel with you for your workout. You wouldn’t sit on a machine covered in sweat so don’t expect anybody else to either. Nothing fancy required here, just something you can fit in your bag that cover the seat of each machine you use. This ultra absorbent towel is just the ticket. It is worth spending a few dollars on a decent towel because the last thing you want is to be jamming a big bulky bathroom towel into your gym bag every time you leave the house. You might think this is a gimmick but trust me it is worth the spend. Listening to music in the gym helps me focus and these earphones are perfect. If like us you are into your tunes then you will need to get yourself some sports headphones for working out. Nothing big and clunky that will catch in pretty much everything as you train. You want to go for something sleek and low profile that almost becomes invisible while you work out. 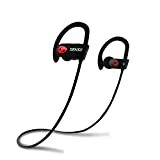 These earphones are wireless, sweatproof and are absolutely superb value for money. They hook around your ears nicely and will stay in place when you hit the running machines. You often see people training with big bulky headphones. You also see them spending most of the time pushing them back onto the heads because they keep slipping off. Tip: Headphones falling out of your ears is very distracting and will cause you to break your rhythm so again its worth investing in a suitable pair of headphones for the gym. Where do I put my phone? Chance are you are using your smartphone to stream your favourite tunes in the gym so will also need something to hold it or another device securely to your arm while you train. If you are looking for quality then you need to check out the link below. They have a great selection of gear in multiple styles for a multitude of device types. 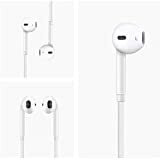 If you don’t fancy having one of these on your arm then look for a pair of gym shorts that has a zipper pocket that will hold your phone of MP3 player. It can be a real pain having to hold one of these whilst you are running. You also run the risk of having headphone cables hanging about that you will inevitably rip out of your ears while in full stride. You will want to shower after your workout. Here is a handy set of bottles for your Shampoo, Conditioner, Body Wash and Body Lotion. They are a perfect size for your gym bag. One of the beauties of this set is that it takes up very little room in your gym bag and for what you get in the set its quite inexpensive. One thing that is a must in the gym is a pair of flip-flops. You may very well have the cleanest feet on the planet, but that does not mean that the person who just walked ahead of you does. Get a pair of these and save on picking up multiple foot problems while you walk around the changing room. This particular pair is also very handy on the yoga mat. Suitable for both the pool and the beach so you get multiple uses out of the same pair. They have a very handy anti-slip sole to stop you ice skating across the floor on the way to the pool. Make sure you read details on each option before you make a purchase as you need them to be anti-slip for pool use. When you get serious about your training you will want to time your workouts and start monitoring heart rate when working through your cardio sets. 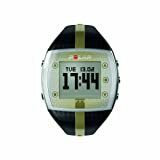 We could post details on well over 100 training watches but have decided to just go for this one as it is awesome and does everything you need anyway. The women’s Polar Heart Rate Monitor Watch is exactly what you need to monitor and manage a good workout. It will really help to keep you on track during each session. It has a Smart Calorie feature that uses your personal information to provide you with details of calories burned during each workout. The watch comes with a soft fabric heart rate chest strap that moulds and adapts to your body shape – giving you all the info you need straight away. The last thing on our list is a workout log. There are numerous distractions in the gym so do yourself a favor and pull together a properly organized workout log. You will want to record times, weight, sets and rest periods. We hope you like our ‘Ten things you need in your gym bag’ and our gym bags for women reviews list. Feel free to add a comment if you think there are some essential items that should be on this list. Or just let us know what goes in your gym bag and why. Thanks for stopping by our best gym bags for women info and we hope you got something valuable from this post. 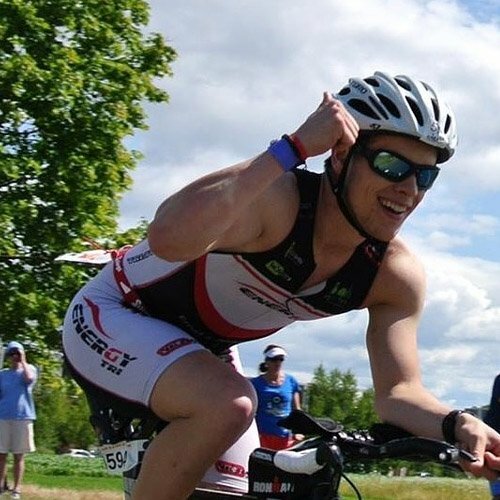 We also have a post on the Best Triathlon Bags available so if triathlon is your thing then be sure to check that post out.